Chelsea told me I have no pictures of Grandpa on my blog, so I told her I would find one and post it. This is one of my favorite pictures of my dad and Ryan. I remember this day and it still makes me smile. It was my Uncle's wedding and when we arrived with Ryan my dad could not wait to get him out of my arms and walk around with him "showing him off". 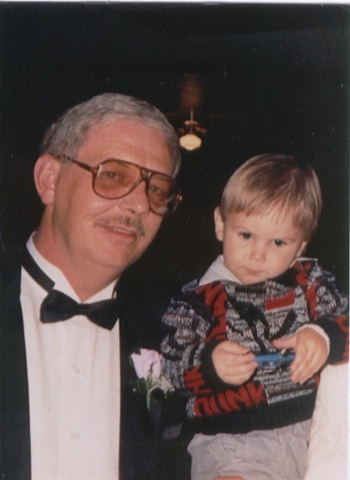 He was so proud of this boy - his first grandson, and losing Ryan changed him as it did us all. I remember my dad at the hospital when we found out Ryan wasn't going to make it. He was sobbing so hard,my sister and brothers thought he was going to have a heart attack. We had never seen my dad cry and to this day even writing this brings me to tears. I was told by many that's losing a grandchild is even tougher than your child. Because you not only suffer from the loss of this grandchild, but then to see your own child in so much pain too. My dad wrote Ryan's eulogy. One day I'll post it. It is beautiful. I remember my mom telling me he would write and then would be crying so hard he had to leave the room, only to force himself back to finish writing it. He had to do it for Ryan.